Otters are such cute furry mammals but don’t be fooled, they are very agile hunters in the water. Normally, seen floating on their backsides, shucking and eating oysters, otters predominantly eat fish. And Salmon are on top of the menu. Not long after hatching from its egg, the baby Salmon dodges many aquatic critters bigger than he is, like the Dragonfly Nymph. Scary as they are, the nymph has protruding mandibles and is truly the ‘face-hugger’ of the fingerling world. Swim away fast, tiny salmon! This is the first in a small series I’m working on, which follows the challenging life of a Salmon fish, taken in ‘snapshots’. Stay tuned for more as I add to the cartoon in the coming days. The quick and nimble Plesiosaurus encounters the megashark, Dunkleosteus. Both creatures were deep sea dinosaurs from the prehistoric seas of early Earth. Check out my illustration which is available at my store now. There can only be one alpha predator. Who do you think will win this battle? It’s a bummer to be a salmon in a world where everybody loves to eat salmon steak and sushi. It’s even worse when salmon have an apex predator stalking them called a Salmon Shark. This is my sketch of a salmon shark on the prowl. He kinda turned out cute. Almost huggable. Largemouth Bass are a North American freshwater fish. Bass are popular as a game fish because of its predatory behavior. They are omnivorous. Meaning they will eat anything that moves, even if the prey may be too big to swallow. In addition to bait fish, bass will consume insects, snails, frogs and even small water birds. 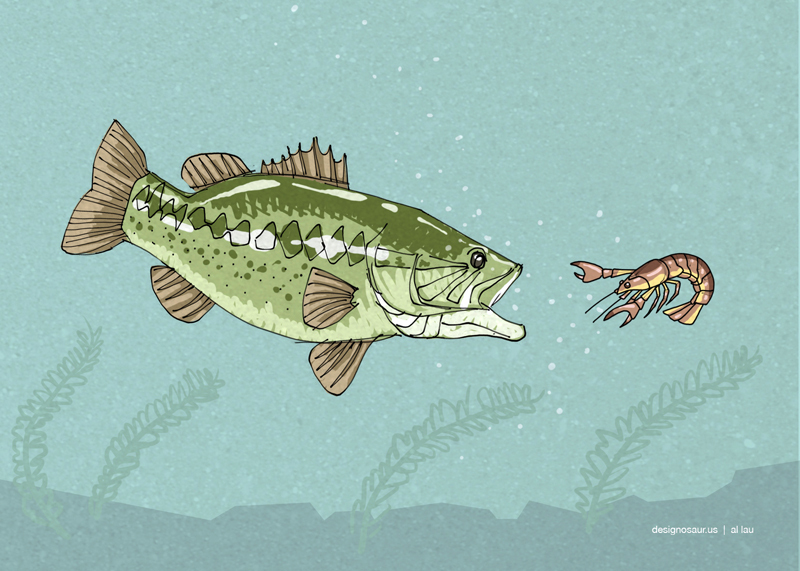 In my drawing, the Largemouth is chasing a fast moving crayfish which makes for a nice crispy treat. But who is the faster one here?